176/200 Max Braden Lifeless. I can't imagine it would hold the attention of kid viewers either. Sony Pictures Animation jumps into the ring with Pixar, DreamWorks, Disney and Fox with Open Season, their first CGI-animated feature. Based on comic strips by Steve Moore, the project will mark the directorial debut of Jill Culton, who has previously had significant roles in creating movies such as Monsters, Inc. and Toy Story 2. 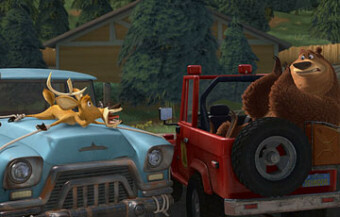 The movie centers on two characters, a scrawny mule deer named Elliot and a domesticated 900-pound grizzly named Boog. The pair suddenly finds themselves trapped in the woods during hunting season, and joins forces to try to rally the other woodland creatures to overtake the humans and turn the tables in their own favor. Meanwhile, Beth, a forest ranger who raised Boog from the time he was a cub, takes off on a journey to try to rescue her friend. See the latest developments for this project on the Open Season Movie News page.